Perfume or parfum is a word coined from Latin phrase per-through and fumus-smoke and a word that is associated with charming bottles with mysterious liquids that arouses all senses, improves the mood and leaves the ultimate first impression. The history of perfume is interwined with humanity and its power and importance were perceived by people in Mesopotamia 4000 years ago. I read that in the beginning incense was used as a perfume and in Mesopotamia, beside ritual purposes, it was rubbed in the skin with various fluids. In ancient Egypt citizens were ordered to apply it at least once a week and the Egyptians, while mantaining personal hygiene, developed a system of baths in which they soaked the skin in oils that prevented drying and at the same time gave satisfaction. Moreover, they practised use of perfume from birth to death and often place it in their tombs to preserve the silky smooth skin in the afterlife. The knowledge about perfumes was taken over and promoted to a higher level by the Greeks and Romans. In addition to the luxurious baths where diverse scents were used, the old Greeks were discussing them, about essential oils ant plant origin, even the influence on temper and mindset. They explored the process of perception of scent and were attributed with the art of making first liquid perfume, although it was quite different from what we know today – it was just scented powder mixed with heavy oils. Roman public baths were spectacular and most famous among them is certainly those of emperor Caracalla. One room, called unctuarium, had shelves with glass jars and bottles of varying sizes filled with fragrant oils and essences. Romans even went so far and used perfumes on their dogs, horses and wings of the birds released from cages during the festivities. Draperies, candlesticks, mattresses…, all was well scented. It is a known fact that Cleopatra had a great understanding of the perfume authority. When she was returning from Rome to Egypt, the sails on the ship was abundantly scented, announcing her arrival with clouds of perfume. Arabs were also noted fans of perfumes. It was physician and chemist Avicenna who developed the procedure of extracting and separating oils from flowers with the help of distillation, which is still being performed today. Equally big admirer was Caterine de Medici whose chambers were linked with the laboratory of her personal perfumer by a secret passage, so no formula would be stolen on the way to her. Louis XV sought another scent every day, he applied it on skin, clothes, furniture and use it instead of water and soap. No wonder that his castle was known as The Perfumed Court. English queen Elizabeth I did not suffer any unpleasant smell and demanded that all people in public places must be nicely scented. At the turn of the 20th century so-called „floral bouquet“ became highly popular, a scent that contained essences of rose, violet, lilac and lily of the valley. Simultaneously, bottles starting to be more important than content, thanks to famous french glass designer René Lalique who crafted the works of art in which perfumes from the most celebrated brands were stored. Love for perfumes is even more expressed nowadays, when we have a vast selection of scents in beautiful bottles. 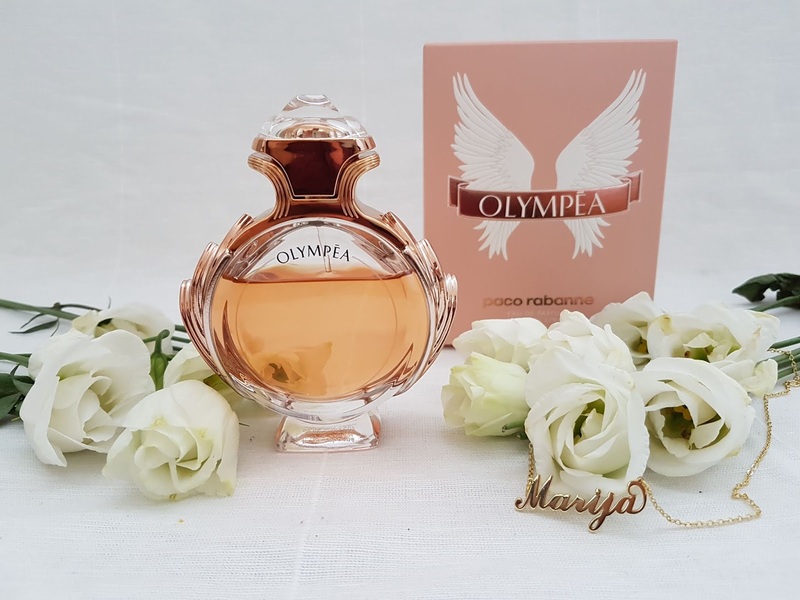 One of my favorite is Paco Rabanne Olympea, which appeared on the market in 2015. 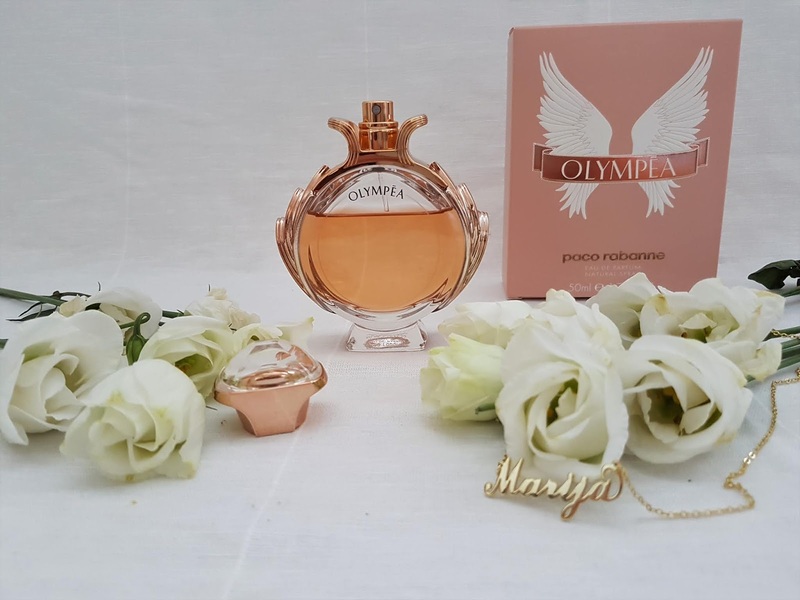 The concept is based on the idea of Greek godess and evokes strength, dynamism and conquest that is visible on the glass bottle itself, coated with laurel wreath, a symbol of victory, eternity and immortality. 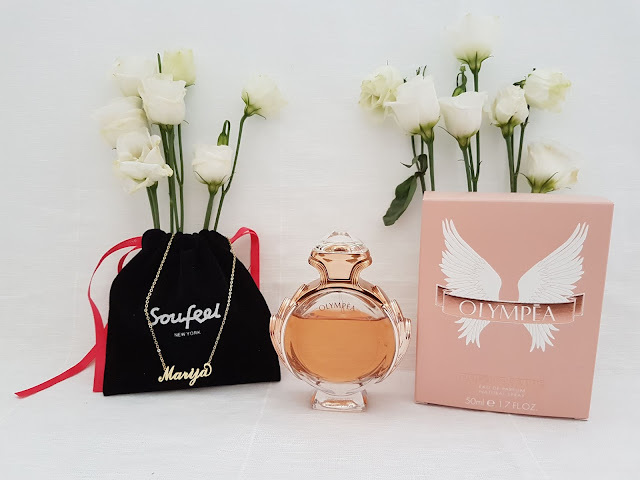 The fragrance is delightful and is described as a salty floral composition characterized by fresh oriental flavor, sparkling green tangerine, watery tones of jasmin, flaming ginger flower on top and salted vanilla in the heart. Basis of this very lovely and unobtrusive scent, which is at the same time warm, gently woody and sweet, is in the notes of sandalwood, cashmere and ambergris. Although not overly strong and invasive, it endures on the skin for a significant period and sometimes I can smell it after the shower, even the next day. 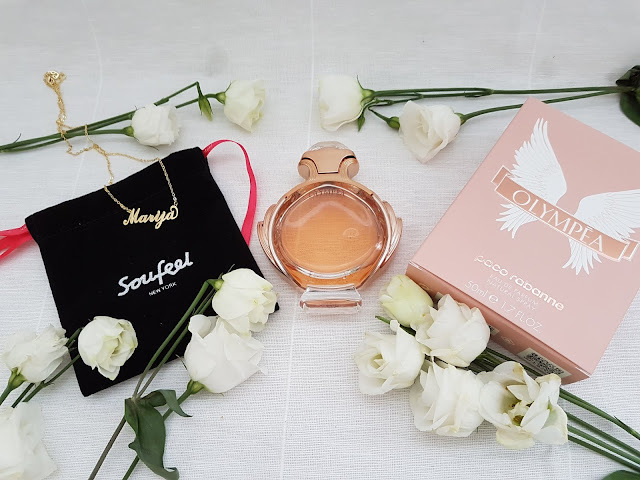 Since it's perfect for winter days when I like long lasting scents and for summer as well because it's not excessively intense and sweet, I can use it all year round. 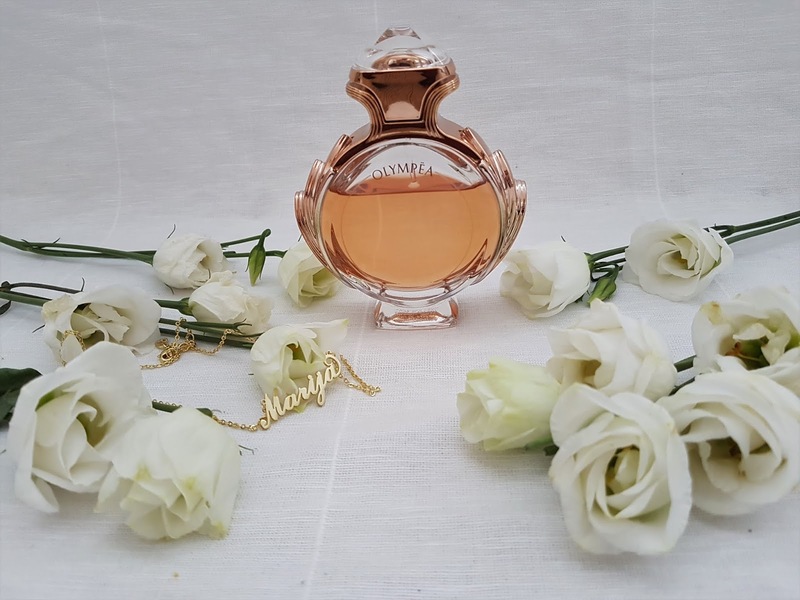 I would depict it as a gentle, feminine and warm perfume and, if you care for these features, unquestionably try it – surely you won't go unnoticed and without compliments. I believe that a scent, much like the name, can be our trademark, except that is subtle and invisible. 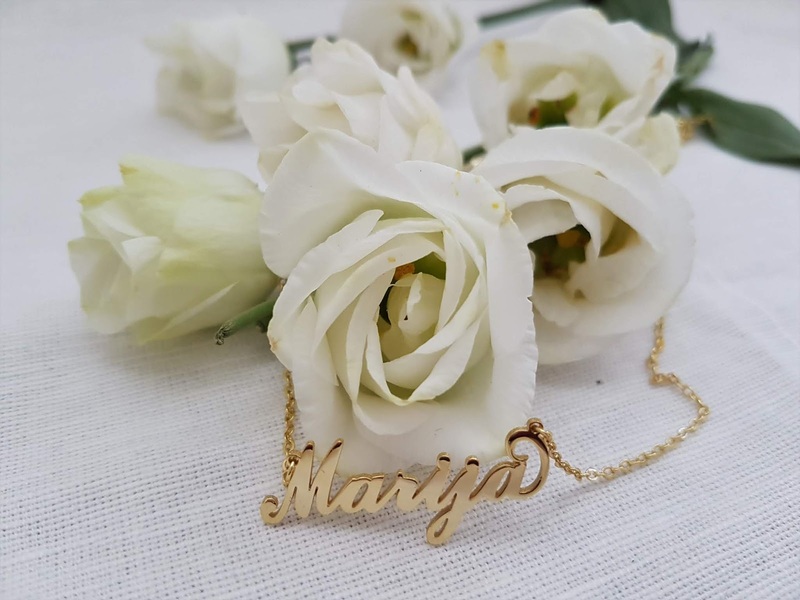 However, if you want to combine your favorite perfume with a personalized necklace with your name on it, you can always create one on Soufeel site. Have you tried Paco Rabanne Olympea? What are your impressions? 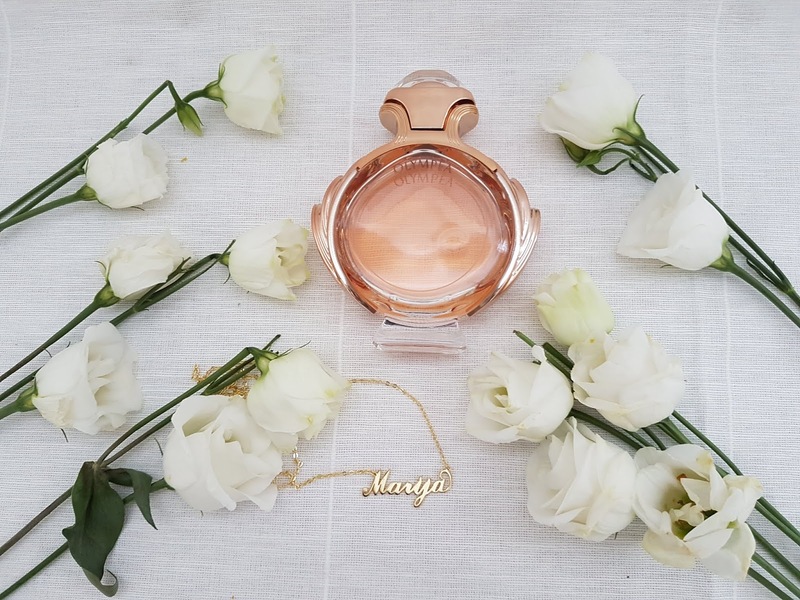 Do you like Paco Rabanne fragrances and what is your favorite? I love this scent and since i am from Greece i was really happy to know about the history behind it! I'm glad to hear that you love this fragrance. Greece is wonderful countrey, with amazing history and cities. It is on my wish list to visit it one day. I hope so very soon. Product is so cute and thanks a lot for sharing history of perfume. You are welcome, dear Corina.